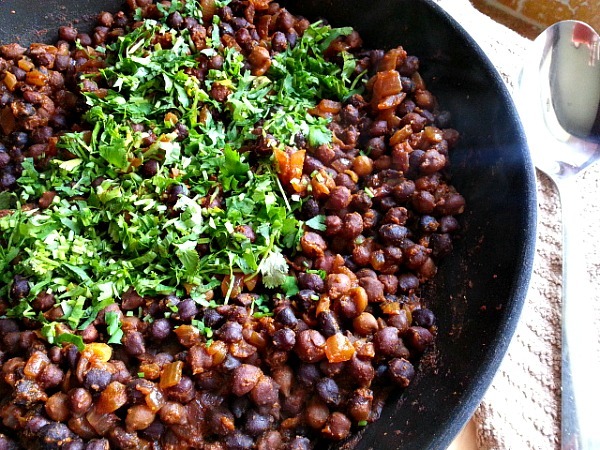 Black Chana or Kala Chana is not a very common garbanzo beans that can be easily found in the US. The only place I know of are the Asian Markets. 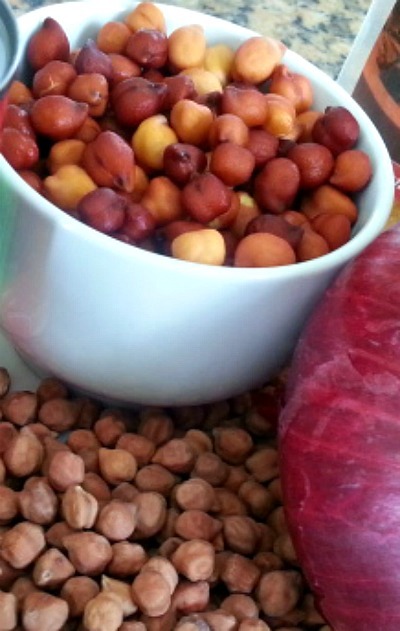 The best way to describe the Black Chana is that it’s the darker skinny version of the garbanzo bean. If you can sense my humor there. Skinny is on my mind. It has a higher protein content and according to Wikipedia has a lower glycemic index and is good for people with diabetics. The curry made with these beans most of the times is very similar to the Red Kidney Beans Curry found in Indian restaurants. But this recipes is a much drier version of the chana. 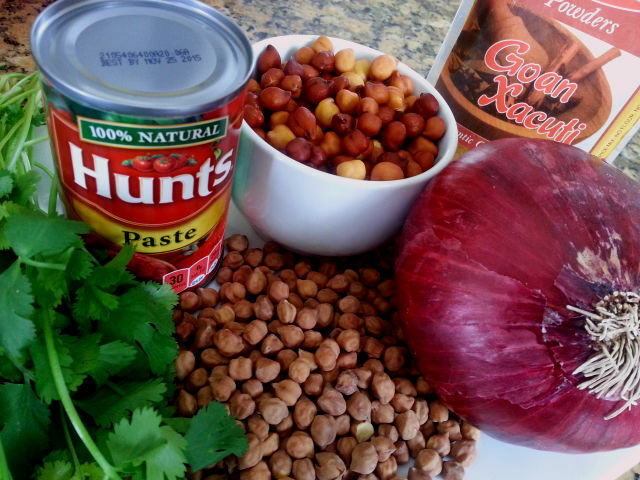 Unfortunately for the Spicy Black Chana recipe I had to do it the long way no shortcuts as you can not buy them canned. It just takes time but it is super easy. Wash and soak 2 cups of Black Chana over-night in 8 cups of water add 2 tbsp of salt. Approx 4 cups of black channa soaked overnight. In a large pot add the soaked black chana add 8 cups of water and cook on medium heat for 90 minutes till soft. Check occasionally and stir. Drain and keep aside. Heat oil in a big pan, add the chopped onions and saute for just about a 2 minutes on medium heat. Do not soften the onions too much you want a bit of the crunch. Next add the tomato paste and xacuti spice mix saute for about 2 minutes. Add the black chana, water and salt to taste. Saute and cook covered for 20 minutes till the water almost dries out. Finish by adding the fresh chopped cilantro. Serve it with rice or bread. It works with a vegan, vegetarian diet. If you have leftovers no worries make a quick mid-morning snack or vibrant salad for lunch. 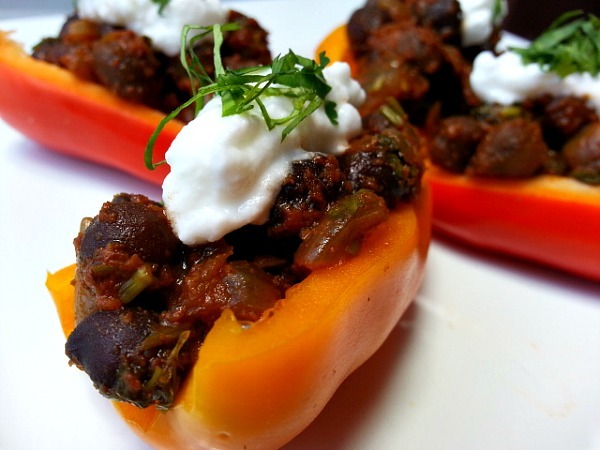 Stuffed halved sweet peppers top it with plain yogurt and freshly chopped cilantro. I truly enjoyed it both ways. Your photos all look beautiful! Which Goan meals would you recommend that aren’t spicy? I’m a bit of a baby when it comes to spicy food but I’m always interested in trying new things! Thank you so much :-). If you are considering one of my recipes then they are medium spiced. But the one to try would be the Xacuti Chicken/ Beef as it is less spicy. I have it on my website. Pingback: Caribbean Eats! Curry Chana – Guyana | Caribbean Eats! Your recipes are beautiful- mine are super, simple fast as lightening. Yours are a work of art! I will be trying some. On your website- the picture of the shrimp dish on the front page looks great! I tried to buy the ingredients in your store but you were out of one. I will check back. I have never made Indian inspired dishes. But I do love the food. So, why not? I do make simple Asian and Lebanese food. Keep ’em coming. It is a doorway to a whole new world for most of us. Its good to know that you want to venture towards Indian Foods. It does have a different dimension if you like spices :-). I do apologize for the out of stock (Xacuti Spice) I underestimated my stock this time and should be hopefully restocked in another week :-). Thank you for visiting my store. I really enjoy your blog. Thanks for sharing, very educative and delicious. Thanks you very much Chitra! 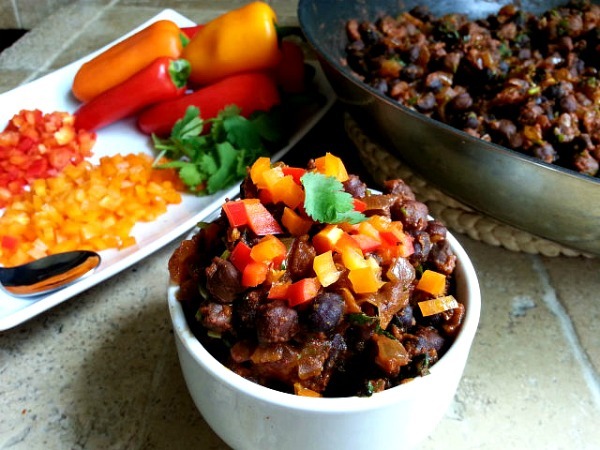 I loved the way you used the chana with bell peppers! Thanks much Aruna 🙂 it was a very random pairing and it tasted good when I eat it for my lunch.